Recently I have experienced a degradation of service quality while trying to watch streams on Twitch.tv. It has only been the last month or so (since The International 2 Dota 2 tournament). While watching the Dota 2 International 2 I was able to have all four 1080p+ streams open concurrently; the main stream, both player booth cams and the main hall crowd cam. During that tournament all four streams ran flawlessly at the same time. That was the last week of August - first 2 weeks of October. Now, however, I can't even watch a single stream at any resolution without getting video freezing, or both audio and video freezing/glitching. Sometimes the video will freeze for up to 10 seconds while audio runs fine in the background. I've tried Firefox and Chrome. All my browsers and plugins are kept rigorously up to date. HDD defragmented with 50% free space. Flushed DNS. Cleared cookies and browsing history on both browsers multiple times. Rebooted router many times. Power cycled router many times. Even reset router to factory settings once. I live directly across the street from my telephone exchange and until now, have never had a problem with download speeds or latency. 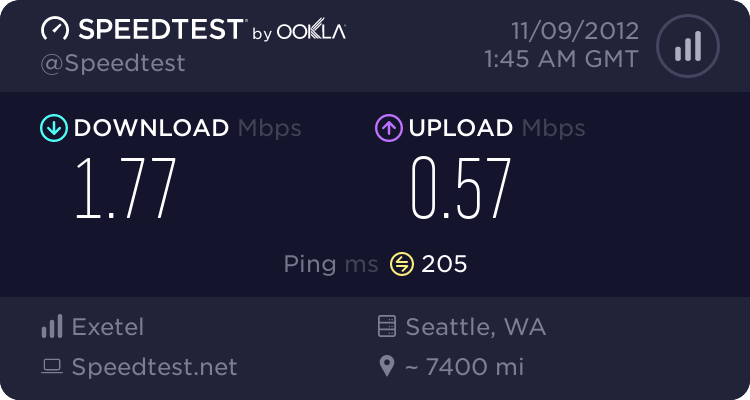 Every SpeedTest result I have ever done has not deviated much at all from the most recent result, posted below, apart from the fact my ping varying slightly between different test servers 35-50ms down to 15ms. 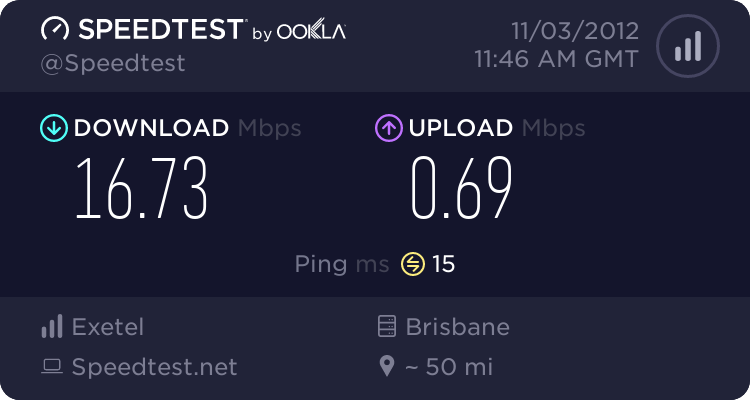 My SpeedTest.net results to servers within Australia are extremely consistent. Traceroute to http://www.twitch.tv surprised me somewhat, ending at the local akamai cdn at 4 hops. I was expecting it to go to the twitch servers in the USA. P.S. As a side note, I was able to watch the same stream that was lagging badly on my PC, on my HTC Desire HD via the Twitch app for Android over the Vodafone data network, albeit at 226p (the only video option on that stream). The same stream on the PC was lagging out at 480p. Every SpeedTest result I have ever done has not deviated much at all from the most recent result, posted below, apart from the fact my ping varying slightly between different test servers 35-50ms down to 15ms. 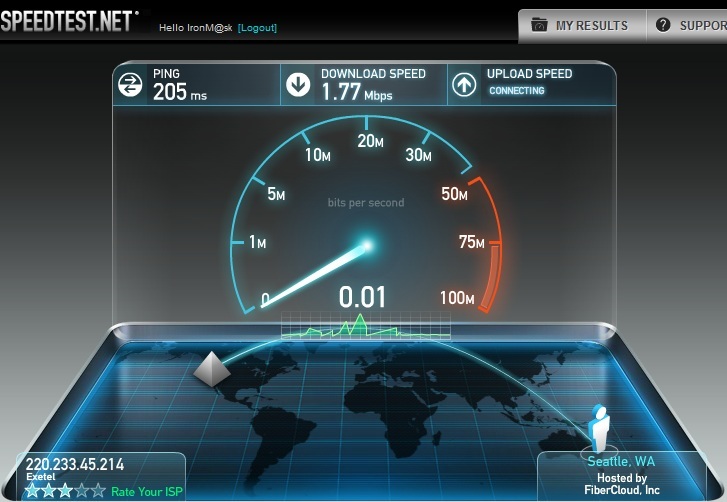 My SpeedTest.net results to servers within Australia are extremely consistent. It could be due to the traffic in overseas link. Seems Twitch.tv is based in US. 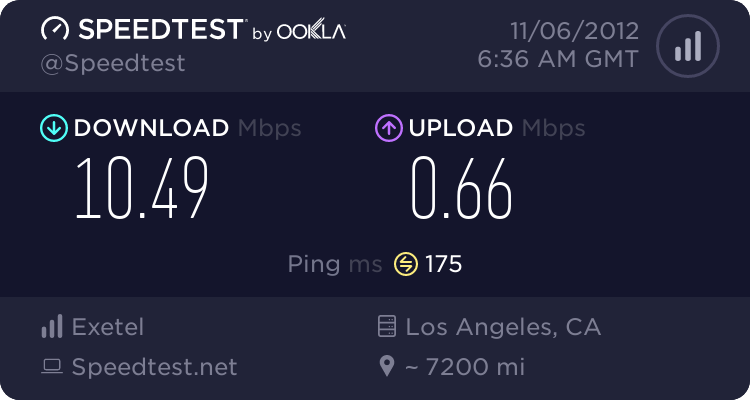 Could you please conduct a speed test via US based server and update me with the results. Both taken yesterday during a period where I was experiencing extreme lag. 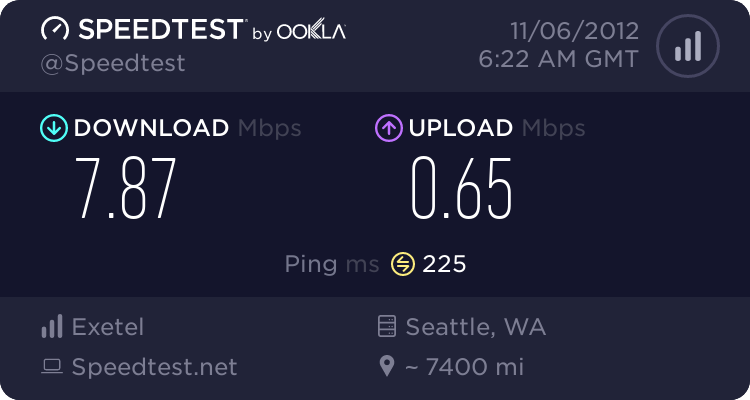 :EDIT: It's worth noting that the actual download graph on my SpeedTest results within Aus are fairly flat and consistent over the test time, but both the tests to the US (Los Angeles and Seattle), while reaching 7.8Mb and 10.5Mb, showed a fairly erratic down speed over the course of the test. I will get this investigated and provide you an update ASAP. Seems twitch.tv has several akamai servers and I tested the latency during different times yesterday. Your trace appears to be completing at one of the local akamai servers. I can not see any significant issue with the results. Could you please check and let me know whether you are still experiencing any latency with this site. ShaminG wrote: I can not see any significant issue with the results. Could you please check and let me know whether you are still experiencing any latency with this site. Yes. First thing I did when I turned on my computer this morning is go to Twitch.tv and tried to watch several different streams for different games. Every one of them experienced the issue I mentioned in the original post. I still cannot watch a Twitch.tv stream without massive freezing of the stream. I should also have mentioned that I have problems with buffering HD Youtube videos as well. All stop to buffer multiple times. Here are 3 more Speedtests taken just now. One local, and two from the US. As you can see, the tests to the US are terrible. Here are two screenshots of the tests in progress. You will notice the speed graph for the local test is almost perfectly flat while the Seattle test is spikey are erratic (and slow). 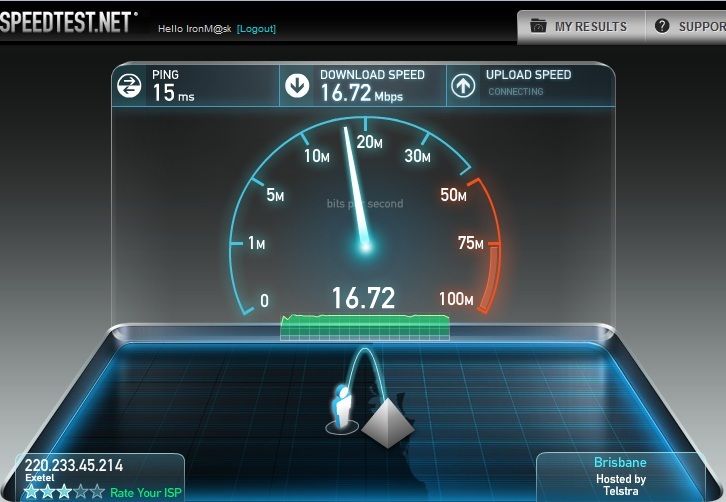 As you could see from the speed tests, you are getting good results when the speed is tested locally. This indicates no issues within Exetel or our wholesale supplier's network. However, when you conducted the speed-tests using overseas servers transfer rates were affected. This could be very likely due to the issues within overseas links. We highly regret any inconvenience caused to you as the matter is beyond our control. ShaminG wrote: This could be very likely due to the issues within overseas links. We highly regret any inconvenience caused to you as the matter is beyond our control. Why does my friend on TPG not have this problem, at all? The internet is a global resource and the majority of useful content exists outside of Australia. I cannot simply "accept" that the state of my internet connection to the rest of the world is as good as it's going to get, because it makes the majority of the internet unusable and my only recourse will be to take my custom elsewhere in an attempt to solve the issue. I've had the same problem for the last two weeks. I don't think tracert'ing to twitch.tv tells the whole story. My streams usually come from telegraph1.justin.tv or telegraph2.justin.tv. 8 26 ms 33 ms 24 ms xe7-0-0-420.sebr2.global-gateway.net.nz [202.50. Any assistance would be appreciated in resolving this problem. Windows tracert has its limitations. An ever-increasing number of devices won't bother replying to it, and it "times out"; ie it hadn't heard a reply by 4 seconds (it usually won't get one if it waits until doomsday).